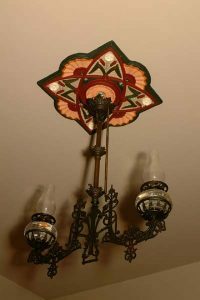 Today I finished painting the ceiling medallion and got it mounted in the parlor. So all of you who were polled earlier can check out the results. I think the colors will make a lot more sense when the rest of the room is decorated, but for now it’s a great feeling to have made some progress in the restoration.